ARLINGTON, TX—Following Ohio State’s 42-20 victory over Oregon in Monday’s inaugural College Football Playoff National Championship, graduating seniors from both teams were admittedly somber after being financially exploited on the field for the last time in their collegiate careers. 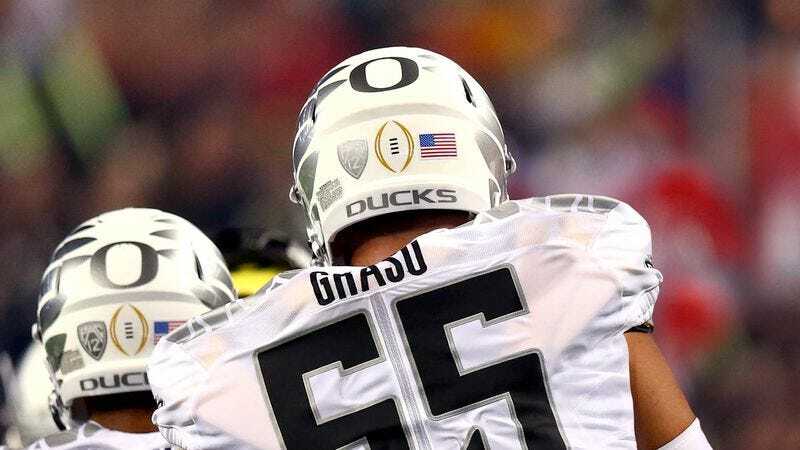 “I don’t think it really sunk in until after the game ended, but it’s hard knowing this was the last time I’ll ever go out there and be completely taken advantage of by an incredibly wealthy institution earning millions upon millions of dollars whenever I play,” said senior Oregon center Hroniss Grasu, who was visibly saddened when describing his final appearance as a pawn used to make enormous profits for his coaches, school officials, and the NCAA without earning a single cent in return. “You never think the day will come when you won’t be able to sacrifice your body on Saturdays for no pay whatsoever while your school generates incredible amounts of money off your back. I’m just glad I really cherished it while it lasted.” Grasu added, however, that he is excited to play in the NFL next season, where his contract can be immediately voided as soon as he suffers a career-threatening injury.